K-Glass, an electronic eyewear device developed by a team of South Korean researchers, is expected to be launched early next year, according to industry experts familiar with the matter. “We plan to commercialize K-Glass in a small quantity late this year or early next year,” said Yoo Hoi-jun, a professor at South Korea’s Korea Advanced Institute of Science and Technology University, in an interview with The Korea Herald. K-Glass shares many similarities with Google Glass. Using the Android operating system, it enables users to surf the Internet, watch YouTube videos, check their email and take pictures. However, what makes K-Glass different from Google Glass is its focus on augmented reality experiences. “Google Glass was originally developed to perform smartphone-like functions. What we wanted to do with K-Glass was to make the device capable of fully providing augmented reality experiences,” Yoo said. He stressed that when smart glasses start to replace smartphones, augmented reality will become a key function. Worldwide, the augmented reality industry is expected to reach $380 billion by 2020, according to the Korea International Trade Association. Augmented reality involves modifying users’ view of reality ― usually through computer-generated input such as sound, video, graphics or GPS data ― to enhance their perception of reality. Such enhancements can be viewed via the K-Glass eyepieces. Currently, Google Glass provides only a minimum level of augmented reality experiences, such as by recognizing the barcodes of products and displaying the related information in 2-D. The level of augmented reality that K-Glass can provide will be much more advanced, Yoo said. “The device will recognize 3-D products and information in 3-D. For instance, when you walk into a building, the eyewear catches and collects all the information you see to display collective, 3-D images,” the professor said. K-Glass can also be integrated with other technologies. “For instance, there are technologies that tap into health conditions … (by monitoring) pulse or heart rates, and this is done by recognizing the face of the user. When K-Glass is integrated with this type of technology, we will be able to scan the health conditions of athletes playing in stadiums or other public venues,” said Kim Gyeong-hoon, a Ph.D. student at KAIST who has been involved in the K-Glass project. 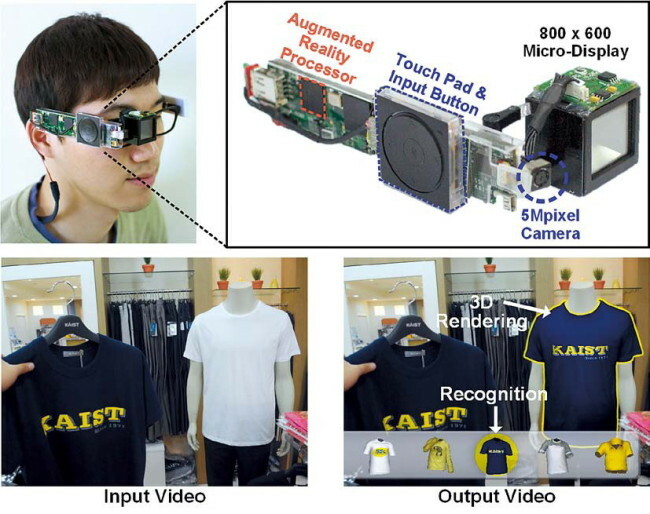 This is possible thanks to an exclusive application processor for augmented reality that was developed by KAIST. This processor makes the K-Glass 30 times faster and consumes up to 10 times less energy than Google Glass, which uses Texas Instruments’ application smartphone processor.